Description: Impressive hgtv inspired house. Almost everything is brand new including roof, siding, flooring, drywall, vaulted ceiling, central heat and air, water heater, plumbing, electrical, wiring, fixtures etc. Almost completely rebuilt after fire. The only things remaining from before the fire are the concrete slab, exterior framing and brick, and some interior framing. The floor plan includes an open kitchen/den with vaulted ceiling. 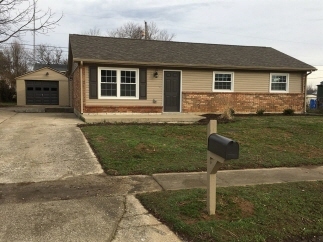 4 bedrooms and 2 full baths make this house a must see. The master bedroom with walk-in closet opens to a nice fenced in back yard. The detached garage makes for a nice addition in the winter time. Located on a cul-de-sac. Data believed correct but not guaranteed. Buyer to verify data prior to offer. Agents read agent remarks.